Al-Din, Rashid. "Coronation Of Ogodei." Digital image. Wikipedia Commons. Accessed August 21, 2010. http://commons.wikimedia.org/wiki/File:CoronationOfOgodei1229.jpg. Al-Din, Rashid. Mongol Cavalrymen Engage the Enemy. 14th C. Bibliotheque National De Paris, Paris, France. Al-Din, Rashid. 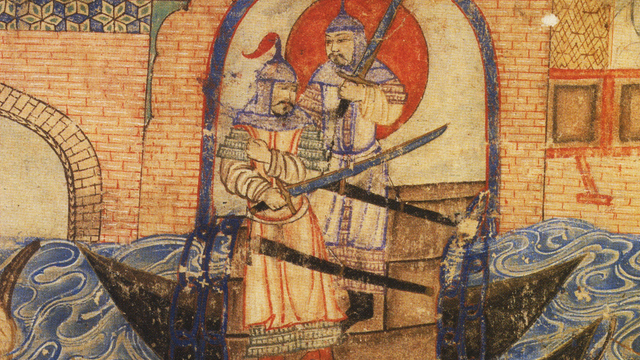 "Mongol Soldiers by Rashid Al-Din 1305." Digital image. Wikipedia Commons. Accessed August 21, 2010. Al-Din, Rashid. Mongols Attacking Baghdad. Jami Al Tavarikh (Compendium of Chronicles). Aubert, David. "Ascelin Of Cremone Receiving a Letter from Innocent IV, and Remitting It to the Mongol General Baiju." Digital image. Wikipedia Commons. Accessed August 21, 2010. http://commons.wikimedia.org/wiki/File:AscelinOfCremone.jpg. Cloth of Gold: Winged Lions and Griffins. Mid-13th C. © Cleveland Museum of Art, Cleveland, OH. De Witt., Per F. Magni Mogolis Imperium De Novo Correctum Et Divisum. 1707. Harvard Map Collection, Harvard University, Cambridge, MA. Ensemble Khan Bogd. Ikh Ezen Bogd Chingiss Khaan. Urs-Albert "Face Music", 2005, CD. "Ghenghis Khan." Digital image. Mandragore, Base Des Manuscrits Enluminés De La B.n.F. Accessed August 21, 2010. "Hulagu and Doquz-Qatun in Syriac Bible." Digital image. Wikipedia Commons. Accessed August 21, 2010. http://commons.wikimedia.org/wiki/File:Hulagu_and_Doquz-Qatun_in_Syriac_Bible.jpg. "Mōko Shūrai Ekotoba 2." Digital image. Wikipedia Commons. Accessed August 21, 2010. http://commons.wikimedia.org/wiki/File:M%C5%8Dko_Sh%C5%ABrai_Ekotoba_2.jpg. Mongol Coin, Minted in Asia. 1206-27. Coins & Medals, © Trustees of the British Museum, London. Palmer, James Le. "Omne Bonum." Digital image. Wikipedia Commons. Accessed August 21, 2010. Paris, Matthew. Illustration from Chronica Majora. Master and Fellows of Corpus Christi College, Cambridge, UK. PHGCOM. "Letter from Oljeitu to Philippe Le Bel, 1305." Digital image. Wikipedia Commons. Accessed August 21, 2010. http://commons.wikimedia.org/wiki/File:OljeituToPhilippeLeBel1305.jpg. PHGCOM. "Mongol Great Khans Coin Minted at Balk Afghanistan AH 618 AD 1221." Digital image. Wikipedia Commons. Accessed August 21, 2010. http://commons.wikimedia.org/wiki/File:Mongol_Great_Khans_coin_minted_at_Balk_Afghanistan_AH_618_AD_1221.jpg. Qalam, Muhammad Siyah. Camp Scene. 1469-1525. Topkapi Palace Museum, Istanbul. "Sacking of Suzdal by Batu Khan." Digital image. Wikipedia. Accessed August 21, 2010. http://en.wikipedia.org/wiki/File:Sacking_of_Suzdal_by_Batu_Khan.jpg. Sakata Field Recordings Reel 2-4. Untitled. Hiromi Lorraine Sakata, 1971. 13th Century Paiza, a Messenger Pass Protecting Officials, Traders, and Emissaries. 13th C. Courtesy of Vahid and Cathy Kooros, with the Cooperation of the Museum of Fine Arts, Houston. Timur Granting an Audience at Balkh on the Occasion of His Accession to Power In1370. 1436. Freer Gallery of Art / Arthur M. Sackler Gallery, Washington, DC. Unknown. "Armenian Archibishop Jean, 1287." Digital image. Wikipedia Commons. Accessed August 21, 2010. http://commons.wikimedia.org/wiki/File:ArmenianArchibishopJean1287.jpg. Unknown. "Caravane Marco Polo, 1375." Digital image. Wikipedia Commons. Accessed August 21, 2010. http://commons.wikimedia.org/wiki/File:Caravane_Marco_Polo.jpg. Unknown. "Map of the Minji Watchpost, in Tüsheet Han Aimag, 1902." Digital image. Wikipedia Commons. Accessed August 21, 2010. http://commons.wikimedia.org/wiki/File:MinjiHaruul.jpg. Genghis Khan felt betrayed by the people of Herat. And his brutal punishment of the city was as swift as it was complete. The Great Khan commanded his army to kill every man, woman, and child. He ordered troops to burn the city and to crush the life-giving irrigation systems; not even animals and plants were spared. Herat, once a great city, was reduced to a massive grave when the Mongols were done. This is just one part of the story of the largest Empire the world has ever known. Many cities have their own tales of Mongol treachery. And although devastating, Herat’s story was not unique. The Central Asian Shah, whom Genghis attacked, was finally defeated, but his son wound up in Afghanistan and Northern India in the 1220s, and so the Mongols had to move into Afghanistan, and particularly in the area of Herat, the major city in Afghanistan. At first, they defeated the people of Herat, and the people submitted, but subsequently, the people in that region revolted against Mongol rule, which was the worst thing they could’ve done, as the Mongols did not believe in allowing people to rebel against their rule after having voluntarily submitted. And so they came in and did considerable damage to Herat and the surrounding region. It was with this military might that the Mongols created the largest land-based empire in world history. The Mongols conquered China and Japan in the East, and Russia and Europe to the West. But out of calamity and ruin rose peace and prosperity. The so-called Pax Mongolica, the peace that the Mongols initiated by taking over nearly all of Asia, at least Northern Asia and parts of Europe, led to a tremendous amount of interaction between peoples. This was a time in which there was considerable travel across Asia, considerable travel by merchants, by religious pilgrims, by entertainers, by individuals who just had a penchant for adventurous travel, and all of that was facilitated by the Mongol peace Eurasia. The Mongol era in Afghanistan witnessed a kind of development of the capabilities of some areas of Afghanistan to set up their own governments and to provide the necessary tasks that people had been subjugated had to provide for the Mongols, postal stations, taxation and so on. As the Mongols conquered greater swaths of land, they also controlled more trade routes. This meant that their tax revenue grew. There was even an early banking system. The ability for businessmen to borrow money led to greater prosperity for the merchant class. And so the Mongols introduced a kind of greater centralization in parts of Afghanistan that had been the case earlier. Of course, the people of Afghanistan also benefited from the cultural interactions and diffusion that occurred throughout the Mongol domain, so there was a kind of balance. The Mongol Empire’s powerful infrastructure ushered in trade and prosperity as well as cultural exchange throughout Eurasia. But the same channels that facilitated smooth exchange of peoples, goods, and ideas, also helped spread the Black Plague. After Genghis Khan’s death, the massive empire proved too large to hold together and it weakened in the 14th century. The true legacy of Genghis Khan’s rule may have been the example he set for his successors. In only a few short decades after the fall of the Mongol Empire, another powerful leader would emerge from Central Asia to build an empire of his own. Ghenghis Khan created the largest Empire the world had ever known. Pax Mongolica was a period of great peace and prosperity that ushered in the advent of passports and interest loans—and also the Black Plague.